HRD attestation is mandatory for educational certificates to use abroad for the purpose of higher studies or employment. State HRDs do the attestation process. It is done only for government approved (UGC/AICTE/NCERT) educational documents. 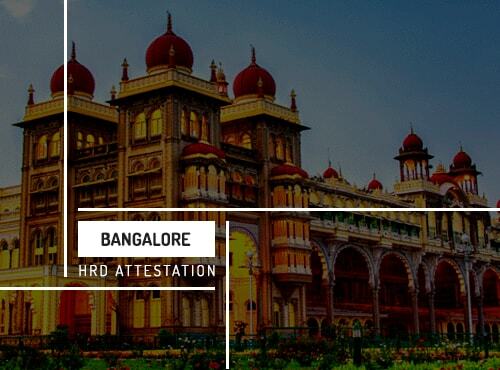 Bangalore (Karnataka) HRD attestation is mandatory for anyone who completed their education from government recognized universities and schools of Bangalore, Karnataka. The educational certificates issued by the state of Karnataka is attested by the Bangalore state HRD itself. Bangalore HRD attestation is needed to prove the authenticity of educational documents to use abroad. It is mandatory to provide attested educational certificates while joining in foreign schools and universities. Anyone who completed their studies from government recognized schools and universities of Karnataka has to get their educational certificate attestation from Karnataka state HRD. HRD attestation is also required for verification purpose for employment in foreign countries. Urogulf is an authorized certificate attestation agency with offices all over India. We help you to get your HRD attestation in time without any hassle. Our team of experts will guide and assist you throughout the HRD attestation process. We offer you stress-free, reliable and quality attestation services. There is no need for you to travel to Bangalore for attestation process. You can submit the certificates in the nearby Urogulf office and we will take care of the entire attestation process for you.